THE BEST BILLFISHING IN THE WORLD... AND CABO FISHING TAKES YOU THERE. Cabo Fishing offers world class sportfishing charters in Cabo San Lucas Mexico, possibly the best sportfishing waters in the entire world. Our deep sea fishing charters will take you to the most fertile waters where fish bigger than you can imagine are waiting for you. Pull in the fish that dreams are made of. These waters are full of monster fish - and we know how to catch them! Picture yourself pulling in a 1,200 lb. 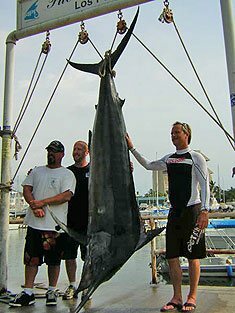 Marlin, or a 400 lb. Tuna - one for the ages. Sailfish, Roosterfish, Grouper, Wahoo - Cabo has them all. We've helped many people live their dreams...and we can help you too! We've included several little goodies on our website to help you plan your trip. Fishing Calendar - See what fish will be biting on your line this vacation! Cabo San Lucas Weather - See climate statistics and forecasts. Cabo Discount Card - Get a FREE gift with all fishing reservations! Cabo San Lucas Links - Helpful Links for Cabo and all of Mexico. Our Fleet - Check out Cabo's best fleet of sportfishing vessels! Testimonials - Feedback and reviews from our fishermen about their trips. Frequently Asked Questions - See most of your questions answered here. Contact Us - You can call us toll-free, or send us an e-mail. Â© 1995-2019 All rights reserved.